Located in southern India, the Nilgiri mountains comprise the southernmost end of the Western Ghats mountain range of western India. It is a low, rolling mountain range dominated by dense lowland forest, but extensive grasslands and thick evergreen groves are interspersed throughout the region. 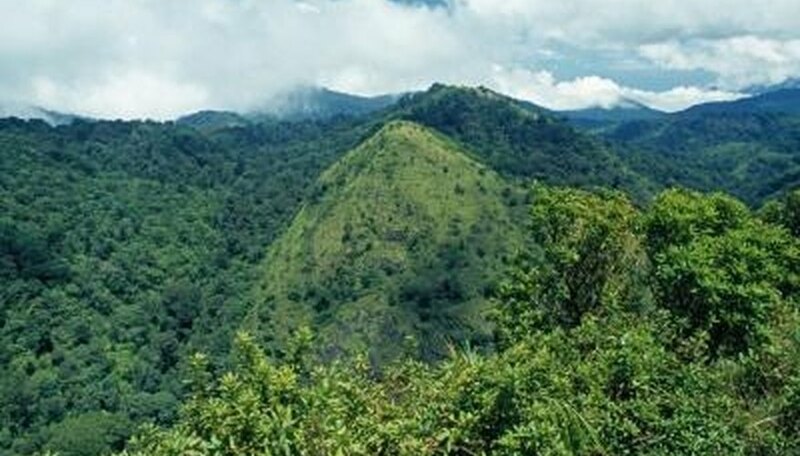 Known for its biodiversity, the Nilgiri mountains are home to a staggering diversity of plant life, including numerous species renowned for their healing properties. Used by Ayurvedic healers for centuries, the medicinal plants of the Nilgiris are now being studied by pharmacologists around the world. Scattered populations of kariyat (Andrographis paniculata) exist within the northern reaches of the Nilgiri mountains, in shaded, high-altitude meadows. It is a small herbaceous plant with an erect growth habit and long, narrow leaves. Starting in spring, kariyat blooms continuously throughout the summer, bearing a profusion of small white flowers marked with purple spots. Known for its extremely bitter taste, kariyat is nonetheless consumed as a medicinal plant by people throughout India for its purported antimicrobial properties. Two-toothed chaff flower (Achyranthes bidentata) is an erect, spreading herb common throughout much of Asia. In India, it thrives in moist areas with dappled shade and is frequently seen along shaded slopes in the Nilgiri mountains. It grows to three feet in height and strongly resembles common garden mint but with slightly broader, more rounded leaves. In Ayurvedic medicine, two-toothed chaff flower is prized for its anti-inflammatory properties and is used to treat swelling associated with gout and minor muscle injuries. Sometimes called snakewood, Indian snakeroot (Rauvolfia serpentina) is a perennial subshrub common to the forest understory of the Nilgiris. Known for its leathery, dull-green leaves, it bears a profusion of showy white and violet flowers throughout the summer. It is prized within Ayurvedic medicine for its sedative properties, which are used in the treatment of a variety of nervous system disorders, including anxiety and insomnia. Native to the mountains of central and southern India, gurmari (Gymnema sylvestre) is a climbing perennial herb common throughout the Nilgiris. Growing to six feet in height, gurmari bears an abundance of dull-green, leathery leaves along its woody, twining stems. In Ayurvedic medicine, the leaves of gurmari are used to treat a range of blood sugar imbalances, particularly diabetes. In addition to its anti-diabetic properties, it is also used to treat tissue inflammation and anemia. A sacred tree in Hindu mythology, the sita ashtok (Saraca indica) is prized for its ornamental foliage and scented flowers, as well as its medicinal properties. Growing to 40 feet in height, it is a relatively small tree with a spreading crown of large evergreen leaves. In February and April, sita ashtok bears a profusion of coral-colored flowers that emit a pleasant fragrance. In Ayurvedic medicine, sita ashtok is used to treat a wide range of ailments, from gynecological problems to dysentery.